Albert Wattenberg, known to everyone as "Al," was a nuclear physicist who served on the faculty of our department from 1958 until his retirement in 1986. A superb high-energy experimentalist, he continued to publish scientific articles until 2003. A student of Enrico Fermi’s, Al was a member of the team that built the first successful nuclear reactor under the stands of the University of Chicago stadium, leading to the first controlled nuclear chain reaction on December 2, 1942. Al was also one of the signatories of the “Szilard Petition” asking the President of the United States not to use the nuclear bomb without warning. After the war, he was among the founders and activists of the Federation of Atomic Scientists (now the Federation of American Scientists), believing that scientists had an ethical obligation to bring their knowledge and experience to bear on critical national decisions, particularly pertaining to the humanitarian uses of science and technology. Al grew up in New York City. His first interest in science came from his brother, a chemist, who trained Al “to keep his glassware very clean.” He also gave Al his first camera, which led to an early interest in optics. At Dewitt Clinton High School, Al helped his team win New York math championships. He received his B.Sc. from City College (1938), and his M.A. from Columbia (1939). The summer after college, Al took a hands-on spectroscopy course at MIT that greatly influenced his life and career. Deeply concerned about fascism and economic justice during the Depression, Al became politically active during his undergraduate years. He organized several student strikes and, although he was the president of his senior class, he boycotted his 1938 graduation ceremonies in protest against the pro-Italian fascist sentiments of the City College president. Jobs were scarce, so Al was delighted when, in 1939, he got a job with the Schenley Corporation, a maker of distilled spirits, doing spectroscopic analysis of chemical compounds. In 1940, when Al was recruited by US Steel, Schenley countered by giving him a large raise and decreasing his work load to 30 hours a week, which allowed him to return to graduate school at Columbia. In 1941, Al was close to finishing his PhD but the war effort intervened. Fermi invited Al to join his group, studying the fission of uranium. The group included Herb Anderson, Bernard Feld, Walter Zinn, and Leo Szilard. As a young and talented instrumentalist, Al learned to use Geiger counters, served as a draftsman and a machinist, and maintained and built photon and neutron detectors. Herb Anderson trained Al to make neutron sources and, after 1943, Al made and maintained all the radium and beryllium sources for the entire Manhattan Project. He also worked with Fermi on measuring the neutron activity in the uranium graphite structure. It was here that Al observed Fermi’s enormous thoroughness and redundancy in experimental work, an example that affected Al’s approach to experiments for the rest of his life. In 1942, the group moved from New York to the University of Chicago. They made quick progress in controlled fission, working 18-hour days, while learning about the theory of chain reactions at lectures given by Fermi. The construction of the first pile started on November 16, 1942. On December 2, 1942, the group obtained the first controlled nuclear chain reaction. Eugene Wigner presented Fermi with a bottle of Chianti, which everybody present signed. As a young member of the group, Al cleaned up after the event—and kept the historical bottle until 1980, when he donated it to Argonne National Laboratory. 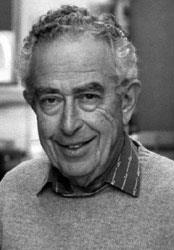 Al completed his PhD at the University of Chicago in 1947. Rather than accept any of several academic job offers, he decided to stay at Argonne to work with Fermi, who had returned from Los Alamos, building reactors to produce intense neutron beams for neutron diffraction studies. In 1949, Al was appointed acting director of the Physics Division at Argonne National Laboratory. Although the lab focused on the development of reactors, Al wanted to work on elementary particle physics. This interest, together with the growing intense scrutiny of government employees for “Communist” leanings during the late 1940s, led Al to leave Argonne in 1950. He stayed one year at the University of Illinois and then moved to MIT, where he did research and taught until 1958. At the MIT synchrotron, he studied properties of nucleons in nuclei and worked on K-meson decays. Al’s insight about the similarities of the weak and electromagnetic interactions of nucleons earned him an acknowledgment in Gell-Mann’s paper about testing vector interactions in b decay. The conserved vector current hypothesis was one of the steps that led to the standard model of weak and electromagnetic interactions. In 1958, the University of Illinois recruited Al by offering him a special research professorship; teaching was voluntary. Although he did teach—much to the benefit of generations of Illinois physics students—Al also appreciated the freedom to pursue research in particle physics. In the 1950s and 1960s, Al worked with his Illinois colleagues on experiments studying K-meson decays in Brookhaven and Argonne, looking for symmetry violations—time reversal, CP, and CPT. In 1967, Al published a paper with the theorist J.J. Sakurai on interference experiments to distinguish matter from antimatter. Al continued to design and build instruments. He authored more than 115 articles between 1953 and 2003. Over his career, Al built large Cerenkov counters at Fermilab and quantum mechanics experiments for the graduate teaching laboratories at Illinois. He worked with huge liquid scintillation counters and with tiny millimeter-sized fibers. He worked on J/ y and charm production, first at Fermilab, with neutron beams (E358, dimuon production by neutrons); later with the wide photon beams (E87, photoproduction of J/y and charmed mesons)—an important experiment that demonstrated the hadronic nature of J/y , and finally at SLAC, using e+e– colliding beams, in the first comprehensive study of the charm sector by the Mark III collaboration. Al’s largest and last project in experimental particle physics was the construction of more than 700 proportional muon counters for the Mark III detector. After retirement, Al participated in the Forum of the History of Physics of the American Physical Society, serving as its secretary-treasurer and as a councilor. He was the editor of the Forum’s History of Physics newsletter for eight years. Al participated in the Program in Arms Control, Disarmament, and International Security at the University of Illinois and continued to contribute to the Bulletin of the Atomic Scientists . Over the years, he gave numerous talks to physicists and to general audiences about the beginnings of the nuclear era and about his work with Fermi. In 2001, he contributed to the celebration of the 100th anniversary of Enrico Fermi’s birth, which was held at the University of Chicago. In addition to being a remarkably gifted scientist, Al Wattenberg was an inspiring example of honesty, integrity, and abiding friendship. He will be deeply missed.